If you, like me, believe that life is a spiritual journey, you will love “Slowing Time” by Barbara Mahany. She’s deeply religious, as is her husband, Chicago Tribune Architecture Critic Blair Kamen. 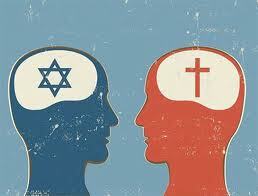 She’s catholic, he’s jewish and their two sons have been raised to understand both religions. Mahany blends her celebration of faith, family and food with her deep appreciation of the lessons and beauty of nature with her sumptuous writing. I’ve been a fan of Mahany – as a person and a writer – for years. Her answers to my questions below should make you a fan too. I recommend her favorite recipe too. 1. What is difficult and what is delightful about an interfaith marriage? Glorious question. What’s delightful is that a whole new universe is opened up to anyone who chooses to dive in: whole new thinkers, whole new text, whole new poetry and prayer. In the interweaving comes the glory — more angles to catch the light, more celebration to dive into, a deeper layered way to understand and see the world. I swoon at the language of Abraham JoshuaHeschel, a mystic and scholar whose words I’d not deeply learned in my years of Jesuit schooling. I love the agrarian roots of Judaism, the exquisite attention paid to the turning of the seasons, to the cycle of sowing and tilling and harvest. Shabbat — the holy pause that comes every Friday at sundown — is among the deepest treasures of my life, of our harried noisy lives where quiet comes only with concentrated effort, with a vow to slow the passing of time. What’s difficult is the sometimes aching loneliness. When I go to Holy Thursday mass by myself. When I partake of the Washing of the Feet, and on both sides I’m pressed against the shoulders of strangers. What’s difficult is watching my children struggle to find their way, because the path at our house is not a sure shot through the woods. It doesn’t take long for a thinking child to see the stark differences between two religions, and as a parent you whisper what you know and then you stand back — within arm’s reach, but with a necessary distance — and watch that child wrestle. There’s an essay in Slowing Time called “Seed Scatterer,” and I write about how I’d once thought that passing along the flame of faith was as simple as turning to kindle a light. But I learned that really it’s sowing seeds along the way. “We scatter all life long, the bits of truth, of hope, the few scant things we know.” And then we stand back, and pray for rain and sunlight, for blossoming to come. What is the hardest question about God or faith that any child has asked you and how did you answer it? One of the hardest conversations I’ve ever had is when one of my two sons, a thinking child from Day One, wrestled deeply and poignantly with the cognitive dissonance at the crux of Judaism and Catholicism. And in the absence of any resolution, he wondered if there was any God at all. And all I could think was, “I failed. Oh, my God, I failed at the one thing that mattered most.” In the hours of that conversation, and in the echoes afterward, I felt shrouded in darkness. But, I’ve learned, over time, that it’s a long and winding journey. And each chapter has its own inherent mystery and miracle. And today, he’s moved to a deeper, different understanding, and I love his candor all along. I love that he knows that ours is a kitchen table — and a home — where these truths can be spoken, these questions asked and wrestled with. And even when tears pour down my cheeks, I am listening. I am loving. How did I answer him? I answered him by listening, listening with all my heart, and allowing him to always return to wherever we left off — in the conversation, in the journey. I answer him by bringing my prayers to the table, and by unswervingly living a life where I see the God in whomever we encounter. When – if ever – is your faith weakest and how do you best respond? Oh, gosh, there’ve been some fallow years. 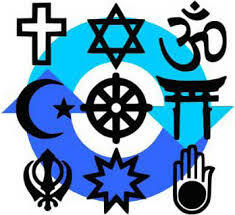 It’s the fallout of two faiths rubbing up against each other, and critically examining the fault lines. And it’s partly the recent sad chapters in the Catholic Church, years when my mother’s wisdom, “Don’t let the Church get in the way of God,” served as a lifeline. All of it added up to a few years of extreme doubt and hollow whispers. Years where my deepest prayer was this: “Dear God, please don’t let the pilot light go out.” What I meant, of course, was even if it was merely a flickering, as long as there was some hint of flame, of godly spark, I had faith that I might emerge from the doubt and shadow and feel the upsurge of knowing. I’d say I’ve found that. I found it in the practice of slowing time, of carving out the quietude in my old house and my rambunctious garden, and in the places where I feel most infused with prayer. I’ve found it in immersing myself in what I call the Holiness Within, and the Holiness All Around. It’s finding the sacred in the messy, noisy ordinariness of our everyday over-scheduled lives. You can purchase the Slowing Time e-book on Kobo here. Bonus question: What is your favorite recipe? 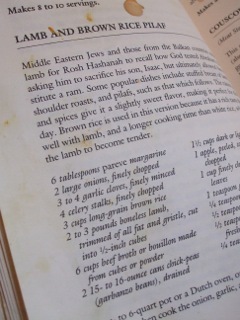 My favorite recipe would have to be the one I write about in an essay called, “Turn and Return,” a Middle Eastern lamb stew that I refer to as “the page most splattered,” pages 82 and 83 of “The Jewish Holiday Cookbook: An International Collection of Recipes and Customs,” (Times Books, 1985) by Gloria Kaufer Greene. Isn’t the most splattered page of any of our cookbooks or recipe cards, the one that marks it as a family heirloom? It’s cubes of lamb with brown rice and chick peas, chunks of apple and raisins, and cinnamon and thyme and allspice. My husband first made it for Rosh Hashanah right after we got home from our honeymoon in 1991 — and we’ve made it every year since. We chop, we stir, we remember. Isn’t that the recipe for all that’s most delicious in our lives? Blair’s lamb stew, a recipe…..
margarine; then cook onions, garlic, celery, stirring til tender. Add rice and cook, stirring, one minute longer. 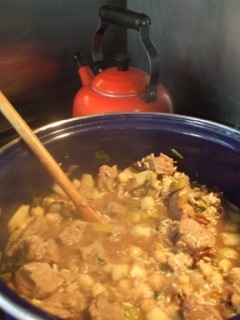 Then add lamb cubes, and stir til brown on all sides. Stir in broth, chickpeas, raisins, apple, parsley, allspice, cinnamon, thyme, pepper and salt. Bring to a boil, then cover and lower heat. Simmer covered, for about 45 minutes or until all liquid is absorbed. Toss with a fork before serving. Invite people you love. Lick the plate. Note: we use more garlic, apple, raisins and lamb than called for, just to make it yummier. although i think this time we followed the garlic, apple and raisin amounts. i think we were closer to 3 pounds of lamb.